Belarus is a former state of the USSR, situated to the west of Russia and sharing its border with 3 EU Member States – Poland, Lithuania and Latvia. Since 1994 it has been ruled by the dictator President Lukashenko. It is the only country in Europe that still upholds the death penalty. The Human Rights situation in Belarus has been deteriorating for some time and human rights organisations have condemned the continued use of the death penalty and the crack down on free speech and civil society organisations. This situation comes in the middle of a ‘rapprochement’ between Belarus and their Western neighbours, according to Amnesty International. 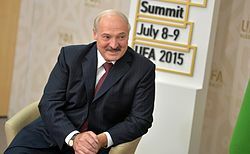 Despite continued human rights‘ concerns, the West is building diplomatic relations with Belarus. The UK in particular is making the most of the rapprochement. Since 2017, the UK has made its first ever ministerial visit to Belarus, arranged trade delegations and increased diplomatic links. The Belarus embassy lists the UK as Belarus’ largest trading partner in the West; since 2012, there has been a 200% rise in trade turnover. This raises the question of what the UK is doing or should be doing to tackle the human rights‘ abuses of the Lukashenko regime. How is the UK upholding democratic values in its links with abusive regimes and when should sanctions be enforced? Recently, I have been approached by an independent media organisation, Charter97, asking for support, regarding the issues faced by Belarus media. Charter97 were the largest independent online media provider in Belarus and were not afraid to campaign for democratic values. As a direct result of their campaigning and reporting they have been brutally targeted by the regime. Following many repressions, including the torture of their editor, they were forced to flee Belarus. Their online presence was then targeted, and they have now been completely censored. Charter97 have also been left with financial problems as, despite the Belarus as, despite the Belarus people find ways to bypass the censorship, they cannot gain revenues for this. Charter97 have been forced to crowd fund. Upholding the value of their reporting, even after censorship, paid off and their readers contributed greatly to their campaign. The European Union and the UK have funds to support free speech in countries such as Belarus, which Charter97 should be able to benefit from. However, they have received limited resources, mainly from central European states. Other free speech advocates from the region have told me that the funding available is often piecemeal and limited. When funds are given, they state that more often than not, they will go to independent organisations who are compliant with the state, not outspoken critical organisations such as Charter97. It is unclear exactly how these pots of funding are distributed, but it is surprising that the largest free online media organisation in Belarus has struggled in this way, especially when their value to the citizens is so clear. I hope that growing trade links will not affect the diversity and probity of organisations who will receive funding. The situation in Belarus raises questions about how the West upholds its stated values on the global stage. I do not believe that the UK should be progressing diplomatic relations with a state that remains so unwilling to reform its approach to basic human rights. Also I believe the UK should be offering meaningful support to organisations that fight for human rights, such as Charter97. If our government truly believes in free speech and the rule of law, resources should be prioritised for organisations such as Charter97, and not trade delegations seeking post-Brexit deals at any price. I would argue that by encouraging trade and diplomatic links with Belarus, and by not asking for meaningful improvements to human rights in return, the UK is endorsing and encouraging state abuses. A similar phenomenon has been noticed with Saudi Arabia; strong Western links have left the regime able to commit human rights abuses with limited redress. Finally, if Brexit happens and the UK can make free trade deals, does the UK’s behaviour with Belarus set a precedent? I hope that we will not see more instances of the UK prioritising trade whilst overlooking blatant and brutal human rights abuses.